No Credit Check - Easy Approval. 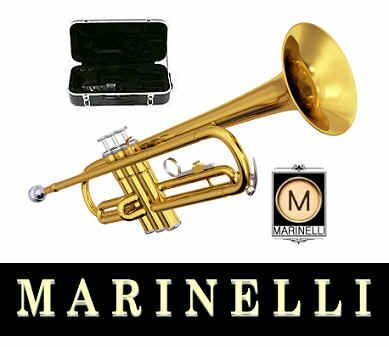 Marinelli Bb Deluxe Student Trumpet Description: Trumpet Specs: 0.459' Bore, 4-7/8' Bell, Monel Valves - Double Braced - Heavy Duty Body - Two Tone Lacquered Finish. 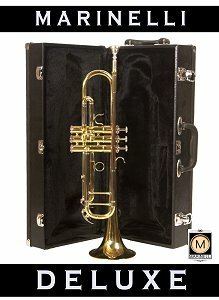 Accessories: Deluxe Wood Hardshell Trumpet Case, Trumpet Mouthpiece and Trumpet Care and Maintenance Kit. The Marinelli Bb Deluxe Trumpet is in the Key of Bb and is a well constructed quality made intermediate trumpet. The Deluxe Marinelli Trumpet has an extra slide, double bracing, genuine monel valves, steel springs and a two tone finish. We also include a 2 Year In-House Warranty with purchase. Options: Buy Now w Discount, Our EZ-3 Payment Plan or a Rent-To-Own plan. Also included with the buy now and EZ 3 Payment plan is a 2 year trade in option. We'll give you up to 75% of your original purchase price toward purchase of a higher end or step up trumpet! We can ship your trumpet anywhere in the USA!